Group bookings can be cancelled for free at least 7 days prior to arrival, if cancelled later or in case of no-show whole amount of reservation will be charged. Come to Enjoy your lovely stay in Prague with us! Ahoy! 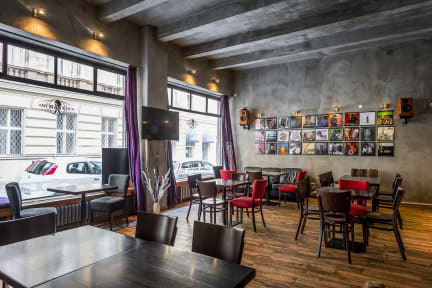 NewTown is located on a quiet residential street within a few minutes walk of the main train station and Wenceslas Square where many shops, restaurants, bars and clubs are located. Although the main tourist areas can be easily reached by foot, we are also 2 minutes of main tram and metro stops. During your stay ask our friendly international team for suggestions on what to see and do during your visit. Each of us have different interests and love to tell you all about our favourite things to do in this beautiful city. You can also join our daily activities such as home cooked dinners, walking tours and seasonal activities like beer garden tours. We also work with various partners offering everything from shooting ranges, skydiving and bar crawls which our receptionists can organise for you. Present café is located on the ground floor of the hostel where you can enjoy great coffee, cakes, beer, wine, soft drinks and local alcoholic drinks. With a relaxed and modern decor and paintings from local artists you can sit back and a relax with a book, listen to great music, play some board games and meet new people. Our rooms are clean and modern with unique artwork on the walls completed by some of our past and present hostel receptionists. Each bed in our hostel rooms have a plug socket and personal reading light so that you can easily charge your devices and see at night without disturbing other people in your room. Great hostel, great place to stay and meet new friends. Morning breakfast and evening dinner were exclellent opportunity to do so. 1euro fridge with beers is big asset too. Beautiful nice kitchen and plenty bathrooms available. Great location! The hostel is located right on the border of the Prague new and old town areas. You are within walking distance from everything! SUPER clean and amazing shower/bathroom facilities. There's a nice cafe/bar and a full kitchen to cook in. During my stay there were several youth groups; I think as part of a school trip. Not a bad thing at all, but just gives you insight into the vibe of the hostel. Good place to get rest so you can explore Prague! Ahoy was great for what my friend and I were looking for. We stayed in a double twin private with a shared bathroom which was very clean upon our arrival. The staff was very friendly and extremely helpful. They also set us up with a great walking tour of Prague and taxis to the airport. Also they had a really great cafe downstairs! We really enjoyed the stay in this place. Our room was large, clean and comfortable. They have power cord extentions and next to your bed you have 3plugs which is very useful. Wifi works well all over the building. The coffee shop was a great place to start a day with fun, music and delicious coffee. And good spot to start the night with other hostel mates. Hadn’t stayed in a hostel before didn’t really know what to expect, but got there early hours met by Chris who was really helpful and set us up. All staff were a laugh couldn’t of been set in a better place tbh. Great place, clean and big and modern! But if need quiet , then it's not the best night sleep but this wasn't a surprise as many of the reviews said this. Maybe if they padded the doors a little or installed different locks that may help . Lots of banging doors in the halls at night with people going to the bathroom/their rooms. But other than this , it's pretty much a perfect hostel! I like the idea of the shared meal at night for 4euro and the nice cafe lounge. Very nice hostel with a great kitchen and close to everything, staff were not very welcoming or helpful, no place to relax and hang out except the cafe downstairs. Awesome storage cages and felt very secure. Good location just a short walk to old town square. Great staff too. Main problem for us was noise travels in this place so can hear everything echoing down hallways etc. Great central location. The room was clean and secure. Didnt have much of a communal area and wasnt as social as some hostels iv been too. Close to pubs and restaurants. The staff could have been nicer and more understanding. I paid 3% charge for a debit card payment to be told afterwards I needed to withdraw cash for the key deposit anyway. It had not been mentioned in the confirmation email prior my arrival. The lady at the desk just said 'oh yeah' for an apology. It upset me. It surprised me there was no code locker on the main door to the lobby/bar. I didn't get any great vibes. Overall, I would not have come back although the location was great.